Coney Island USA Spring Gala. The Spring Gala is the premiere fundraising event for Coney Island USA. This benefit draws a host of celebrities, trendsetters, and performances by superstars of the Burlesque and Sideshow movement. 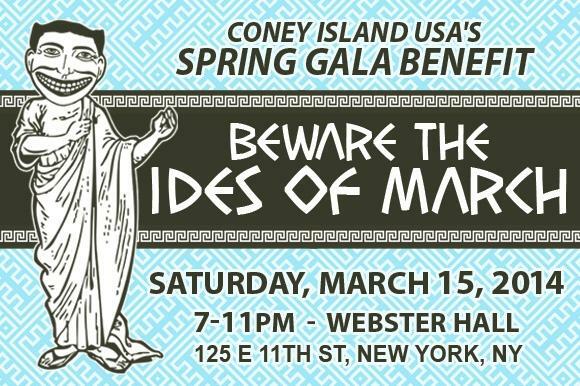 The 2014 Spring Gala is titled: The Ides of March. This year, for the first time ever, they will be naming the Coney Island USA Man and Woman of the Year, for their outstanding support of Coney Island throughout the year. The honorees are Lisa Mangels-Schaefer, and the entire Mangels Family, and Steve and Dennis Vourderis, as well as the Vourderis Family. Go Go Extravaganza: Anja Keister, Wae Messed, Sizzle Dizzle, Dottie Dynamo, Boo Boo Darlin, Brief Sweat, Bunny Buxom, Cheekie Lane, Clara Coquette, Ginger Twist, Lina Tantalette, Marlena Dee, Heather Whatever, Miss Poison Ivory, Zoe Ziegfeld, Lucille Ti Amore, Hard Cory, Sincerely Yours, Tiny D, Delysia Lachatte, Dolly Debutante. V.I.P. admission: $250 (includes open bar, catered hors’ d’oeuvres, gift bag, exclusive access to VIP section and bar) [tickets].